Hi everyone! Today’s Let’s Discuss post is about finding books in unexpected (really random) places. I have chosen 5 different locations that I have (and so could you) found books. And they’re not exactly bookshops or library…. This has got to be the most suprising one for me – the bank? 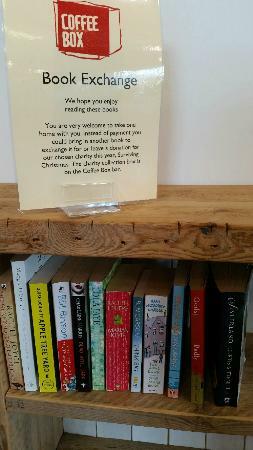 Granted, this one was a little hidden and the charity notice was out-of-date, but nonetheless, BOOKS. IN THE BANK. My mum pointed this shelf out, and as I’m in hospital every couple of months recently. And when you’re a bookworm like me, it’s hard not to have a quick peek! Old, classic, read phone boxes are a staple to England…and this is one near me! Not many of these are actually working now, but libraries are a great way to make use of them. This idea might not be quite as crazy as the rest, but charity book boxes do pop up in unexpected places. I know at least a couple of books I’ve read have come from these great little places! These delightful little things can actually appear anywhere. At the side of the road, outside a house, in the middle of a forest (well, that’s a little less likely but you know what I mean). They’re cute and a great idea. I really enjoy all the places you can find books! Happy reading!